Salman Khan and Shah Rukh Khan are now the bestest best friends in the industry but there was a time when the two superstars had a nasty fall-out which had divided the Bollywood into two camps. 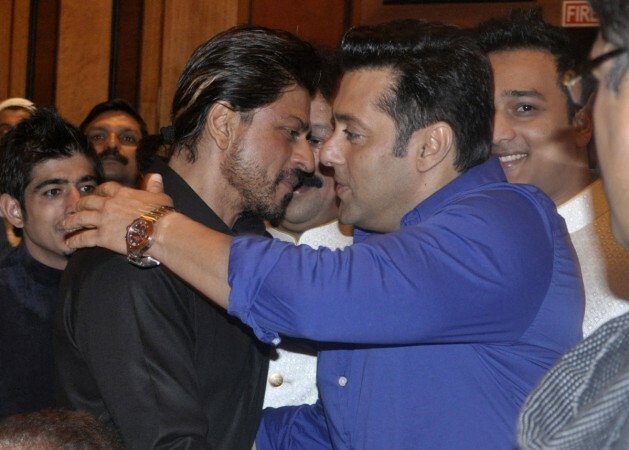 It wouldn't be wrong to say that the bond of friendship between Salman Khan and Shah Rukh Khan has been a rollercoaster ride that not just witnessed a never-ending bromance but one of the ugliest fights in the Bollywood industry as well. The two are now the bestest best friends in the industry but there was a time when the two superstars had a nasty fall-out which had divided the Bollywood into two camps. It all started when an inebriated Salman had barged onto the sets of Chalte Chalte in 2002 and created ruckus with his unapologetic behaviour. A member of the film's unit had said that Salman was uncontrollable for almost four-and-half hours and allegedly harassed Aishwarya on the sets as well. When SRK tried to intervene and stop him, an angry Salman had grabbed SRK by his collar which further intensified the situation. The shoot was called off by the director Aziz Mirza thereafter. It was that time of the year when Salman had broken up with Aishwarya Rai and the latter was supposed to be romantically paired with Shah Rukh Khan in the film. SRK didn't take things lightly and decided to drop Aishwarya from the film and was replaced by Rani Mukerji. After the incident, Aishwarya had ranged SRK and apologised for everything that had transpired. Fast-forward to 2008, Salman and SRK, who were not on talking terms, unfortunately came under the same roof to celebrate Katrina Kaif's birthday party on July 17. During this time, Salman had moved on from his bitter break-up with Aishwarya and found solace in Katrina's arms. It was being said that Salman and SRK shared cold vibes and were seen staring angrily at each other at the party. When the two came face-to-face with each other, they soon broke into a heated conversation. According to eye-witnesses, Salman, at a particular point of time, had started belittling SRK by reminding him of the low TRP of his reality show Kya aap Paanchvi Pass Se Tez Hain? Salman was seen boasting about how his show Dus Ka Dum had garnered TRP and how SRK couldn't turn his show into a hit despite being a superstar. What began from taking jibes at one another, ended up in an ugly fight when SRK made a snide comment on Salman's ex-girlfriend Aishwarya Rai. Not to take things lightly, Salman angrily snapped at SRK and the two reportedly exchanged blows until Gauri Khan stepped in and pulled SRK away from the fight. Gauri soon excorted SRK out of the party while Aamir Khan, who was also present at the party, tried hard to solve the dispute between the two but to no avail. The incident left the industry divided into two camps where Salman had received support from his fellow actors, SRK was backed by his director friends. But now, Salman and SRK are back together as brothers and all the bad blood that exist between the two has now vanished into thin air.